More than 70 years after they fell, the bombs of German Luftwaffe planes still pose a threat to modern day Britain, with members of the Royal Navy called into tackle an unexploded WWII device in Portsmouth early Wednesday. The terror of Nazi German sorties over British cities ended after Adolf Hitler’s forces were defeated in Europe during World War II. However, memories of the bloody conflict still lurk in the 21st century, as evidenced by the discovery of a WWII bomb beneath the waters of Portsmouth harbor. The harbor is currently being prepared for the arrival of a new 65,000-ton (metric) aircraft carrier and the unexploded bomb was found in the early hours of Wednesday morning by a ship dredging at the entrance to the busy port. 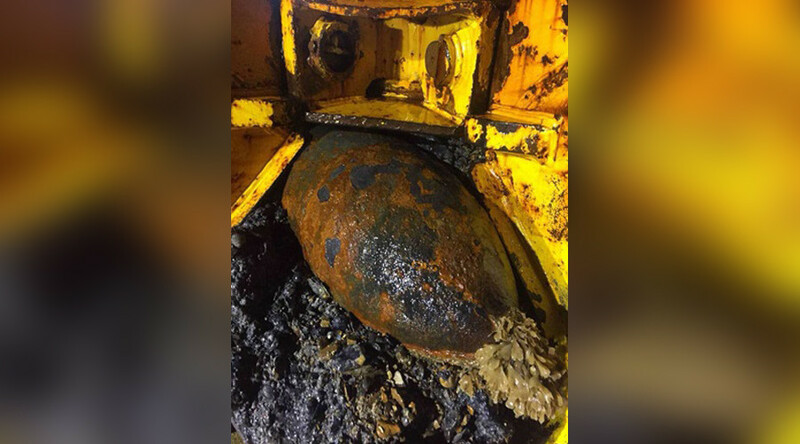 Pictures of the device posted online by the Royal Navy show a rusted metal shell, identified as a German SC250 explosive. The 500lb (227kg) device would have been dropped by Luftwaffe bombers on their way over the United Kingdom between 1940 and 1944. According to the Royal Navy, a team of divers were dispatched to the area and the bomb was brought further out to sea, off the Isle of Wight, where it was detonated safely. Footage of the Royal Navy disposal operation shows the WWII bomb erupting beneath the waves of the English Channel. “Portsmouth-based Southern Diving Unit 2 towed the bomb away from the harbor, lowered it to the seabed, and planted explosive charges for a controlled detonation of the device. Shortly after 11am, it was destroyed in a plume of smoke and spray,” a Royal Navy statement said. The local port authority shut down the harbor for hours after the early morning discovery. Harbour closure affecting all ferry sailings please contact your ferry operator for further details. Portsmouth harbour now re-opened. Please check with your ferry operator for update on sailing times. The incident saw disruption to shipping in the area, with Condor Ferries forced to delay its service to Guernsey. Brittany Ferries has since warned customers to expect some delays to departures out of the area.